Windows of Turkish embassy smashed in reaction to downing of Russian war plane, Moscow, Nov. 25, 2015. Russian President Vladimir Putin says the United States knew the flight path of a Russian jet, shot down by Turkey last Tuesday, and should have informed Turkey, its coalition ally. "The American side, which leads the coalition that Turkey belongs to, knew about the location and time of our planes' flights, and we were hit exactly there and at that time," Putin said in Moscow Thursday. "Why did we give this information to the Americans if they did not pass it along to the rest of the coalition?" The U.S. has an agreement with Russia to avoid aircraft collisions over Syria where both countries are conducting bombing campaigns. Turkey says it issued repeated warnings that the plane was in its airspace before shooting it down. Russia announced Wednesday it is sending S-400 missile system to Syria's Latakia province, which borders Turkey. Putin said that it was "not possible" for Turkey not to have known that the plane was Russian, as suggested by Turkish President Recep Tayyip Erdogan on French television. "If it was an American aircraft, would they have struck an American?" Putin asked rhetorically. "What we hear instead is they have nothing to apologize for." In an interview with CNN, Turkish President Recep Tayyip Erdogan said his country would not apologize for downing the jet. "I think if there is a party that needs to apologize, it is not us," Erdogan said. "Those who violated our airspace are the ones who need to apologize." The Turkish leader sounded somewhat more concilatory in another interview Thursday, telling France 24 television: "Had we known it was a Russian plane, we may have acted differently. But our pilots know the rules of engagement and have to do their duty to protect Turkish airspace." Erdogan added that he and Russian President Vladimir Putin “need to talk about what happened," but said the Russian leader "has not answered my calls." Russian President addresses newly arrived foreign ambassadors of 15 countries during receiving credentials ceremony in Moscow's Kremlin, Russia, Nov. 26, 2015. Earlier Thursday, Putin called the shoot-down "totally inexplicable treacherous stabs in the back from those we believed to be our partners and allies in the fight against terror." He again insisted that the plane was shot down in Syrian airspace, calling the incident "against common sense and international law." "We received no comprehensive apology from Turkey's highest political level, no offer of compensation for the harm and damage, and no promise to punish the culprits of this crime," Putin said. "One gets the impression that the Turkish government is consciously driving Russian-Turkish relations to a deadlock. We regret that." FILE - The Egyptian Bazaar is shown with stalls beautifully displaying spices, dried fruit and nuts, in Istanbul, Turkey, Oct. 29, 2013. Russia is tightening restrictions on Turkish imports as tensions remain high between the two countries. Speaking to local officials in Ankara on Thursday, Erdogan said the downing of the plane was "an automatic response" in line with the Turkish military's rules of engagement and that Russia had not been specifically targeted. But he said Turkey would respond in "the same way" should "the same violation happen again today." Erdogan also denied Russian accusations that Turkey has purchased oil and gas from the Islamic State group, and said his country's fight against the jihadists was "undisputed." He demanded anyone accusing Turkey of buying from the militants show proof of their accusations. "Our country's stance against Daesh has been clear since the very beginning," Erdogan said, using the Arabic name for the Islamic State group. "There is no question mark here. Nobody has the right to dispute our country's fight against Daesh or to incriminate us." He also said Turkey was taking precautions to stop oil smuggling at its borders, which has been a key source of revenue for the militant group. 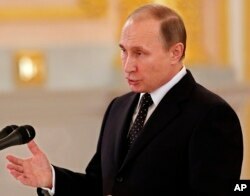 But Putin said that lines of oil tankers have been observed taking oil from Syria to Turkey and returning empty. “We see this every day,” he said, adding that it is hard to imagine that the Turkish government does not know. Russia's Defense Ministry announced Thursday that it had suspended all "channels of interaction" with Turkey's military, including a hotline set up to avoid clashes in Syrian airspace. 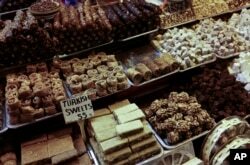 Russia also said it would subject Turkish food imports to extra scrutiny. Russian Prime Minister Dmitry Medvedev, center rear, at a government meeting in Moscow, Russia, Nov. 26, 2015. Medvedev ordered measures drawn up that would include freezing some joint investment projects with Turkey. A Kremlin spokesman denied Moscow was imposing an embargo on Turkey, but said the new restrictions were put in place for "various reasons," including the threat of "extremism." Moscow's agricultural ministry said the reinforced controls on Turkish food and agricultural products were due to "repeated violations" of Russian safety regulations. Following the order, Russian media reported that trucks carrying Turkish goods were stranded at the border. The step is similar to the apparently punitive restrictions Russia has placed on other countries following disagreements over foreign policy issues in recent years. Russian Prime Minister Dmitry Medvedev also said Thursday that Moscow would be looking to cut economic ties with Turkey and scrap investment projects in a matter of days. He instructed the government to draft sanctions against Turkey within the next two days in a response to the downing of the Russian Su-24, which he described as an "act of aggression against our country." Russian officials have disputed Turkey's claim that the plane had violated Turkish airspace and was warned repeatedly before being brought down. It was the first time in a half-century that a NATO member shot down a Russian plane. One of the pilots who parachuted from Su-24 arrived Wednesday at a Russian base in Latakia after being rescued by members of the Syrian army. Alexander Orlov, Russia's ambassador to France, said the second pilot of the downed jet was "killed in a savage way." He was reportedly shot by rebels while parachuting toward the ground. Speaking to reporters there, the rescued pilot denied that the jet had entered Turkey's airspace "even even for a single second" and insisted that the Turkish authorities had issued "no warnings whatsoever" to the plane before it was shot down. However, Turkey released audio recordings of what it said are the Turkish military's repeated warnings to the pilot of the Russian plane before it was shot down at the border with Syria -- audio that grows increasingly more agitated. The recordings, made available to The Associated Press on Thursday, indicate the plane was warned several times Tuesday that it was approaching Turkey's airspace and asked to change course. In the recordings, a voice is heard saying in broken English: "This is Turkish Air Force speaking on guard. You are approaching Turkish airspace. Change your heading south immediately." Most of the audio is garbled and barely comprehensible but the tone of the voice gets more agitated as the warnings appear to go unnoticed. The audio that was released only involved Turkish warnings, no replies by a Russian pilot. It was not clear if Russian replies were received but not released by the Turkish government, or if the Russian pilots never replied to the warnings or if they never heard the warnings. Earlier this week, Erdogan said his country was simply defending its security when it shot down the plane. On Thursday, he said the downing of the Russian fighter was an "automatic reaction" in line with standing instructions given to the military. While Erdogan and Turkish Prime Minister Ahmet Davutoglu said they do not wish to escalate tensions with Moscow, Russia has announced several responses to the downing. Defense Minister Sergei Shoigu said Wednesday the military will send its advanced S-400 missile system to Syria's Latakia province, which borders Turkey. It is also deploying the guided missile cruiser Moskva to the area. Turkish officials have issued multiple warnings about aircraft violating its airspace during Syria's 4½-year civil war.